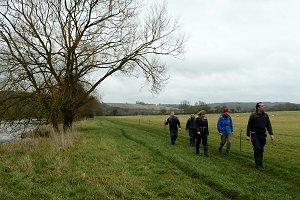 Walking along the Oxfordshire Way near Lower Assendon. On Saturday 10th October, fifteen of us met up at Henley-on-Thames railway station, from where Mike led us on a half-marathon course around Henley and Hambleden. We walked it, of course. We started off walking through Henley and joined the Oxfordshire Way. This took us up through woodland to No Man's Hill where it opened out into tree lined fields. From here we did a bit of road walking to the hamlet of Fawley where we stopped to look at a well before crossing a field into Gussett's Wood. Encountering some curious cows near Hambleden. Walking through the wood, we came to Luxters Farm vineyard and brewery where we stopped off to visit the shop. Next to the shop was Old Luxter's Barn, a venue often used for weddings. In fact two of our members were married there just a few years ago. 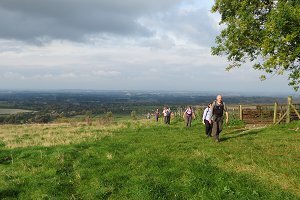 We continued through Cadmoor Wood and stopped by the edge of the wood for our picnic lunch, on top of a hill with a view across the Hambleden valley. After lunch we descended the hill and followed the road for a short while before joining the Chiltern Way at Pheasant's Hill. 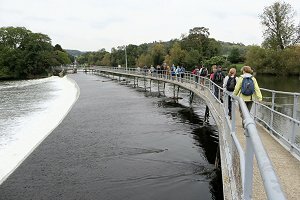 Walking along the weir at Hambleden Lock. We followed this route as far as Hambleden, where we stopped off at the Stag and Hunstman pub for a drink. Suitably refreshed, we continued south along a footpath through farmland, taking us to Mill End and Hambleden Lock. We crossed Thames on the metal walkway over the weir. Now south of the river, we made our way to the village of Aston and from there across open countryside to Remenham and then Remenham Court. 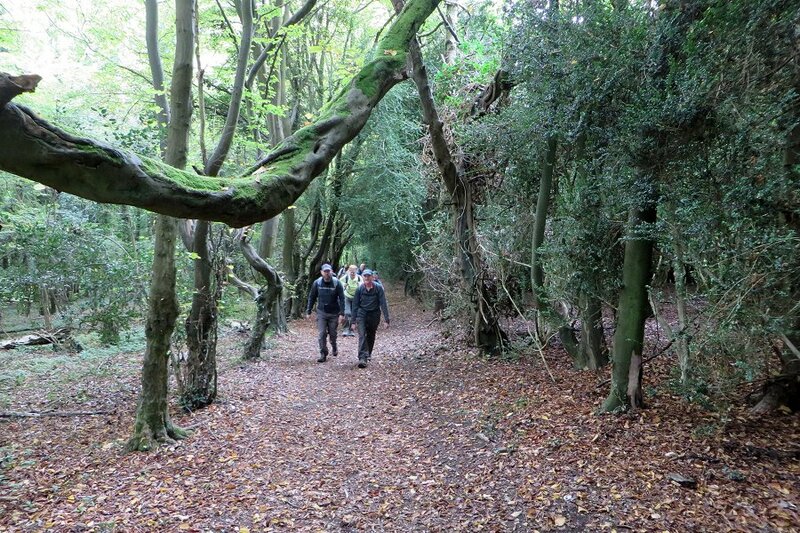 Here we descended through woodland back to Henley-on-Thames. We crossed the Thames again at Henley Bridge and made our way back to the railway station where the walk ended. See our our route on Bing Maps. Following a stream as we leave Ecchinswell. 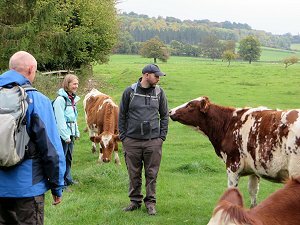 I led a walk on Sunday 18th October from White Hill, near Kingsclere. Twelve people and a dog called Fido came along for this walk, which was made out of bits of other walks I'd already led around that area, plus a new bit in the middle to join it all up. We set off along the Wayfarer's Walk, heading west. The Wayfarer's Walk is a 70 mile path from Ink Pen, near Walbury Hill, down to Emsworth, on the south coast. We only followed this route for about a mile and a half, over Watership Down, as far as Nuthanger Down. Along the way we could see the Sydnonton Estate below us and further in the distance we could just see Newbury. We descended to the hamlet of Sydnonton, which we walked through before passing Watership Farm on our way to Ecchinswell. At the edge of the village we took a scenic route looping up and around Nuthanger Farm, stopping to look at the raised barn that is mentioned in Richard Adams' book, Watership Down. 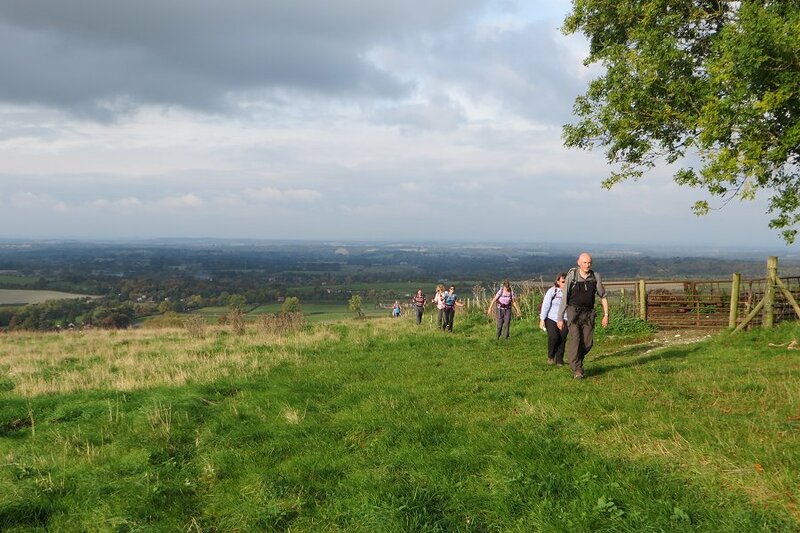 Reaching the top of Cottington's Hill. After stopping for our picnic lunch at the edge of a field near Nuthanger Farm, we continued our route into Ecchinswell, where we stopped at the Royal Oak pub for a drink. Suitably refreshed we left Ecchinswell, heading east into Frobury Park. We passed the fish ponds, surrounded by anglers, and headed south. We crossed Ecchinswell Road and continued south through farmland. Perhaps it's time I confessed that I hadn't pre-walked this part of the walk and as a result, I made a wrong turning. Luckily we didn't go very far before I realised my mistake. Back on the right track, we touched the southernmost tip of Kingsclere before heading south across the gallops and up the steep path through the woods to the top of Cottington's Hill. From here it was just a short walk back to the car park. See our route on Bing Maps. Posing for a photo in a wind-swept valley by the Ridgeway. 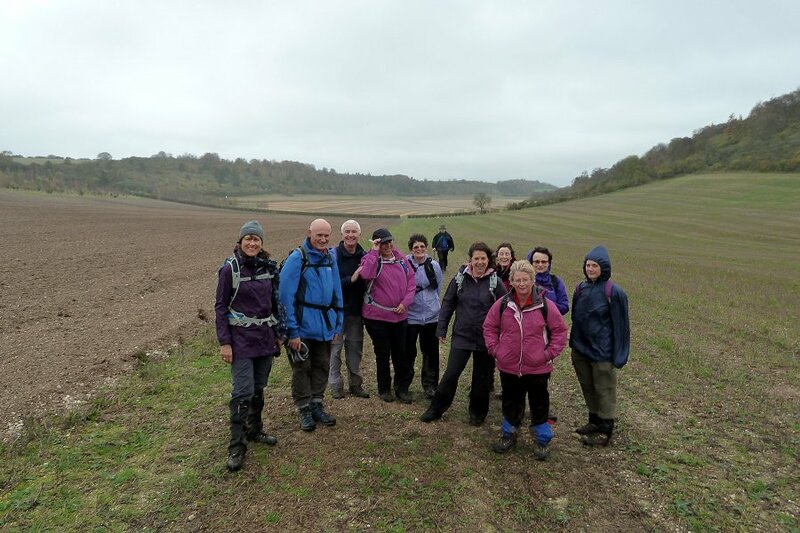 On Sunday 8th November, led by Jo, twelve of us set off from Streatley for a 9 mile walk which began along a stretch of the Ridgeway. Despite the overcast skies and misty rain it was great to get out in the countryside and to enjoy some good company. There was some unexpected mud to negotiate along the way and many of us were glad of our gaiters. The planned lunch stop at Lowbury Hill had to be abandoned as it was shrouded in cloud and would have been too exposed with the wind. 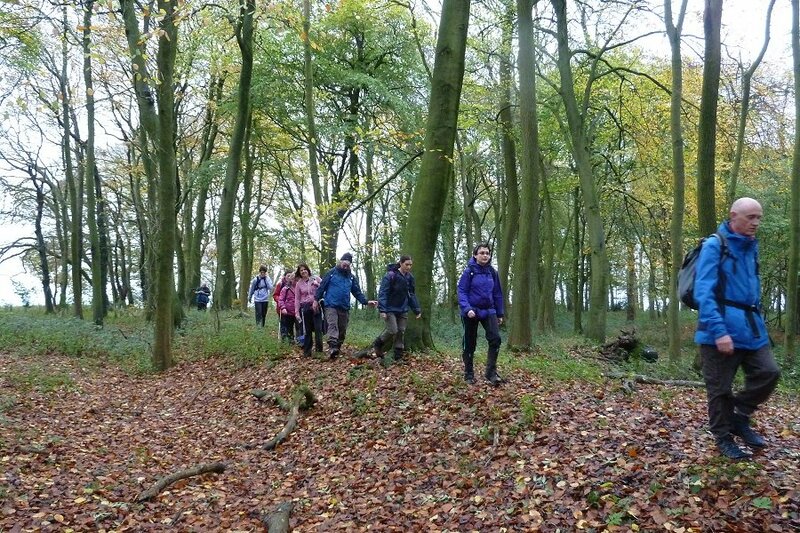 Walking through a leaf-lined copse. So we continued on, eventually finding a sheltered spot in a field near Cholsey Downs where we stopped to eat. As the weather had cleared a little we were able to enjoy some views of the rolling countryside and stripy fields. The last leg of the walk included a pleasant leaf lined copse where there was still plenty of Autumn colour on show. Returning along the Ridgeway led us back to where we had started out. The afternoon then ended with a sociable drink at the cosy and characterful Catherine Wheel pub in Goring-upon-Thames. Thank you to Julia for writing up this walk and for providing the photos. Wallabies in an enclosure at Berkshire College of Agriculture. 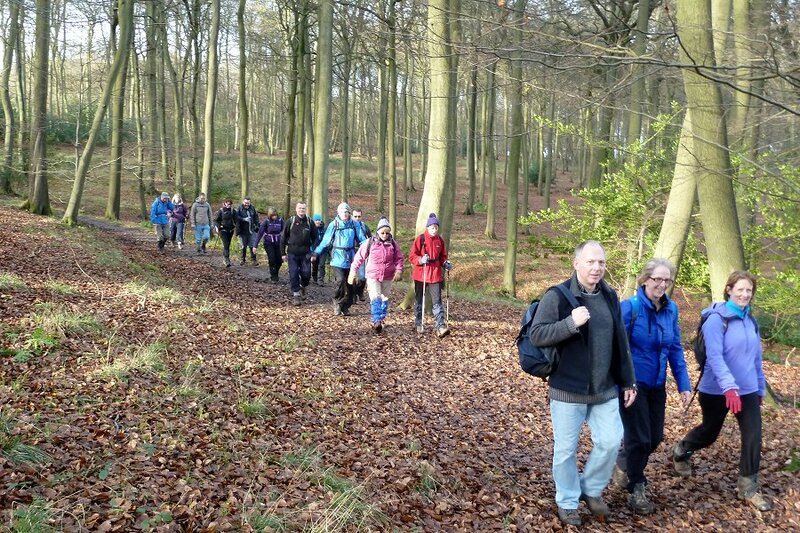 Fifteen of us turned up on Sunday 22nd November for the Turkey Walk. A walk that would include the biggest collection of turkeys I've seen, and I'm not referring to the walkers. Starting from the car park near the Thicket roundabout on the A404 we headed west, crossing the A404 on a footbridge into Maidenhead Thicket. Emerging from the woodland of Robin Hood's Arbour, we crossed open fields to enter the Berkshire College of Agriculture near Burchett's Green. The footpath through the college takes you past a number of enclosures containing species normally unseen in the UK. 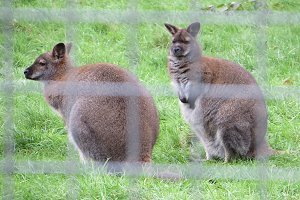 We saw Wallabies, Emus, a Scottish Wild Cat and some Red Squirrels. Seagulls standing around at Marlow. We descended the steep and muddy Prospect Hill to Hurley. It was often necessary to hang on the the fence to prevent yourself from slipping over. Crossing through Hurley, we joined the Thames Path at Hurley Lock, where we also made use of the public facilities. We followed the Thames Path, including several footbridges, until we reached Marlow. Here we stopped to eat our packed lunches before crossing the River Thames at the road bridge and heading into Quarry Wood. This involved a steep and muddy uphill stretch to Cookham Dean, and then a walk through Copas turkey farm. 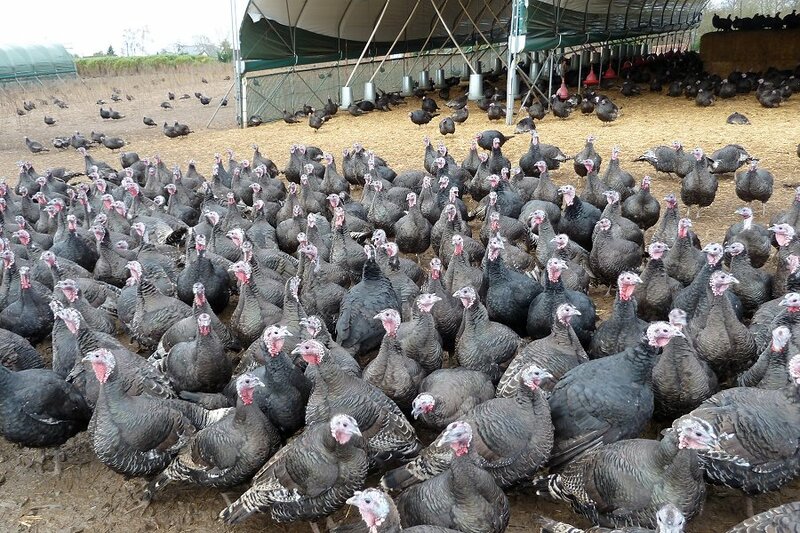 Never have I seen so many turkeys. They were free-range and were quite curious of us as we passed through. They seemed happy and blissfully unaware of their impending fate. 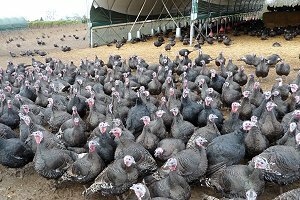 A few of the many turkeys at Copas Farm. Following the Chiltern Way, we passed through the woodland Cookhamdean Common and then through Pinkneys Green before crossing the under the A404 to Robin Hood's Arbour. From there we retraced our steps back to the footbridge over the A404 and back to the car park from where we'd started. See our route on Bing Maps. 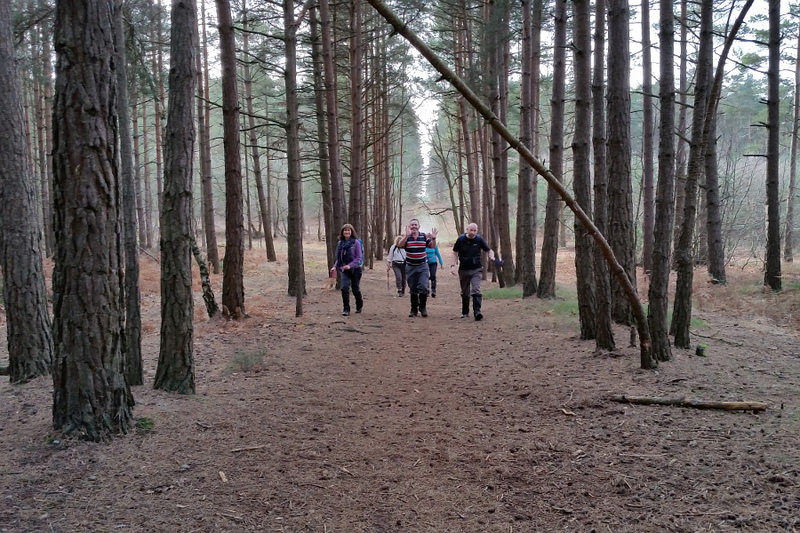 This 11½ mile walk was made more demanding by the large number of muddy paths. We'd had a spell of heavy rain in the week preceding the walk, but hopefully the extra exercise has done me some good. Julia and I also managed to pick some sloes along the way. Julia is now making some Sloe Gin. Walking along the Thames Path between Mapledurham and Pangbourne. 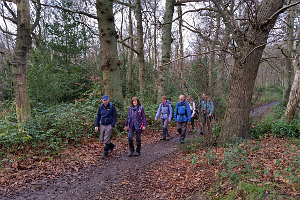 Six of us met up at Mapledurham Lock on Saturday 12th December for a six mile walk. I think the weather put a few people off. It was very dull and grey. I'd been in two minds about going when I saw the weather forecast, which predicted heavy showers. In fact the walk was completed without a drop of rain falling on us and it wasn't even cold or windy. 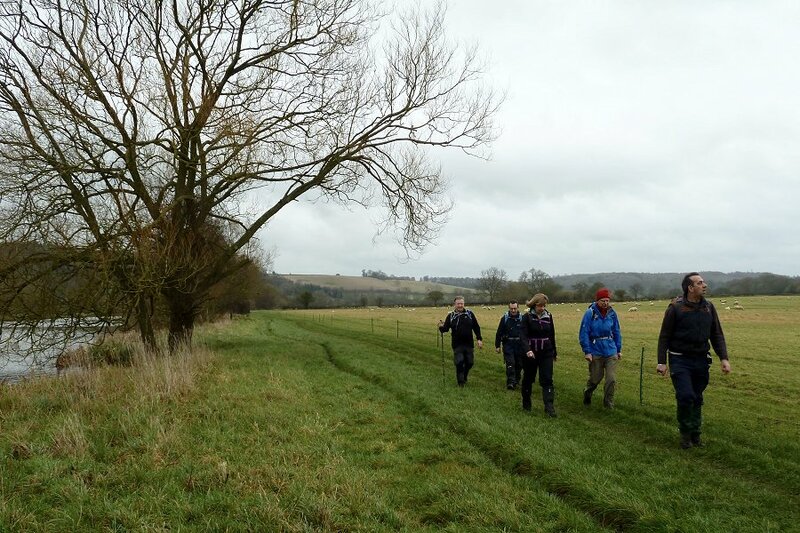 The walk started by following the Thames Path west towards Pangbourne. Along the way we spotted what I thought was a heron, although this was more accurately identified as a cormorant by others in the group. 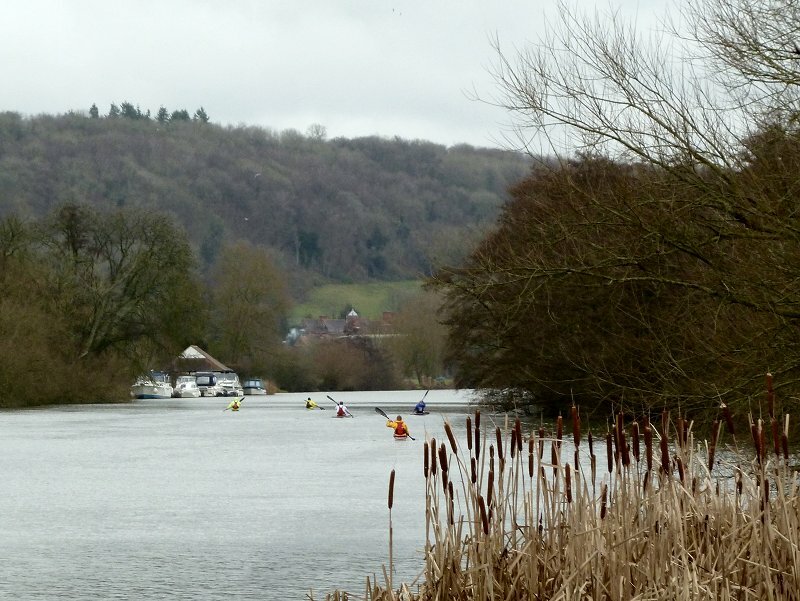 We also saw a number of canoeists making their way along the Thames to Mapledurham. 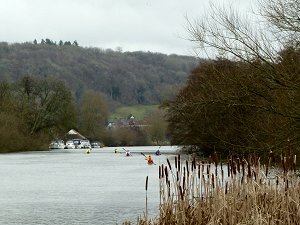 Canoeists making their way along the Thames. 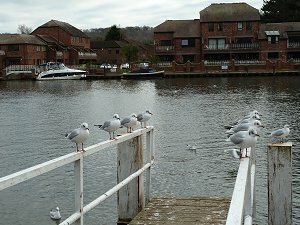 Before reaching Pangbourne, we turned off the Thames Path and headed south. We passed under a railway bridge and emerged onto the A329 just on the outskirts of Pangbourne. Crossing the road we continued south, following Sulham Lane. Just before reaching Sulham village, we took a footpath across a field into Sulham Wood. Turning left as we entered, we followed a northbound footpath, stopping off to have our picnic lunch where we'd found some fallen trees to use as benches. 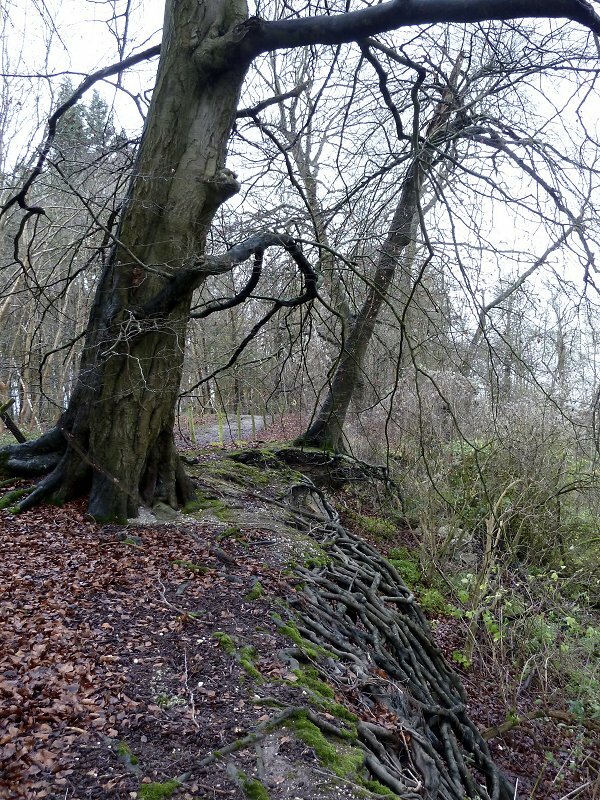 Tree roots struggling to keep hold of the ground as it erodes. After lunch we continued to follow the path through Sulham Wood up to Mosshall Wood, where we noticed some trees barely clinging on the ground as the soil was falling away. 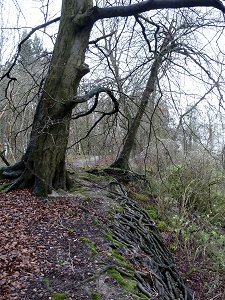 One or two were at an awkward angle with some of their roots hanging in thin air. Leaving Mosshall Wood, we crossed a field and entered Purley-on-Thames. We followed Beach Road until it joined the A329, which we crossed and took a footpath between the houses that led us over the railway and through a field to Purley Village. This is where most of us had parked, so the group split up here rather than go up to Mapledurham lock and back. See our route on Bing Maps. 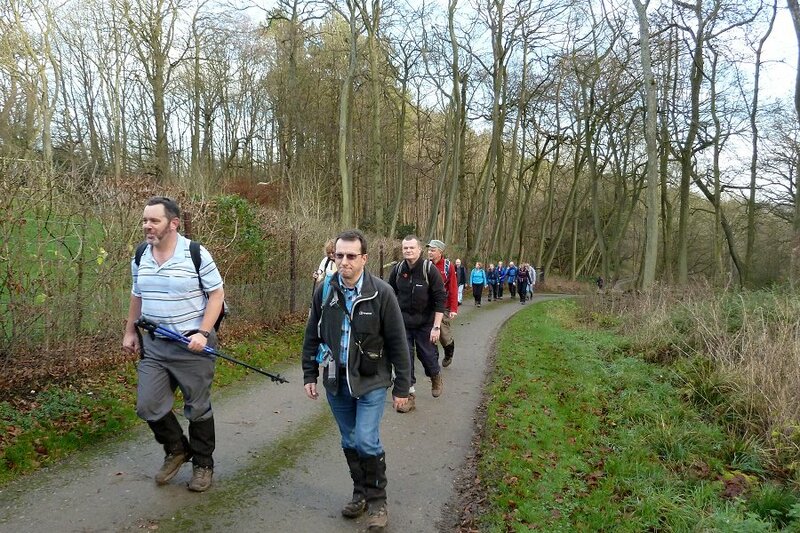 This was the first walk that Mark J had led for us and it went very smoothly. We were finished soon after one o'clock, leaving plenty of time to get on with other things, which was handy at this busy time of year. Thank you to Julia for providing the photos. Stopping off for mince pies and mulled cider. Sunday 20th December, the day after our annual Christmas pub crawl, eight of us met up at the Ambarrow Court car park for a nine mile walk led by Julia. 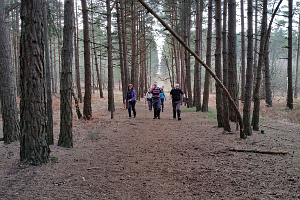 We started the walk by heading west through the woods, joining the Three Castles Path at the pedestrian crossing over the railway line and then following it into Little Sandhurst. The route passed through part of a quiet housing estate before entering Edgebarrow Woods. The woodland path was also being used by a very large group of runners doing a charity run of some sort. We made way for them as they passed us in dribs and drabs, finally splitting away from us at an entrance to Wellington College. 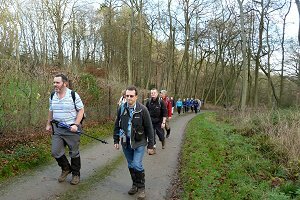 Crossing Crowthorne Road, we continued to follow the Three Castles Path through Edgebarrow Woods, stopping briefly for a special Christmas treat. I had brought along some mince pies and Julia had brought some mulled cider. She also brought some mulled apple juice as a non-alcoholic alternative. After our festive elevenses we continued on our way, passing within sight of Broadmoor high security hospital. We could see the new buildings being constructed as we crossed the new access road connecting it to the A3095. Passing through woodland up Butter Hill, we joined the Devil's Highway - a Roman road. Walking through pine forests at Caesar's Camp. We crossed under the A3095 and left the Three Castles Path and the Roman road to head north and then north-east through pine forests to Caesar's Camp - an Iron Age hill fort constructed some 2600 years ago. 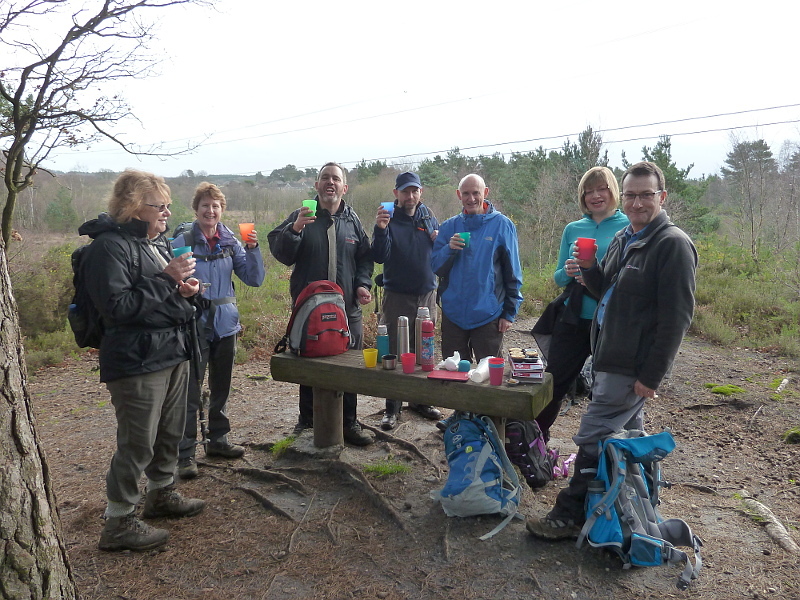 As the forest opened out to heathland, we found a suitable place to stop for our picnic lunch. After lunch we continued to cross Caesar's Camp and then followed a figure-of-eight pattern through the forest and back to the Roman road at its crossing with the A3095. We rejoined the Three Castles Path, which we followed back the way we'd come. It began to rain about a couple of miles before we got back to the car park, but we didn't get too wet. See our route on Bing Maps. On the fourth day of Christmas, seventeen of us gathered at the free car park at Christmas Common. 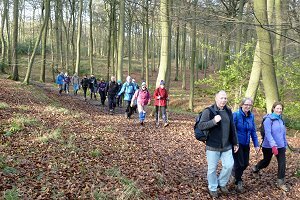 Our last walk of 2015, and our two-hundredth walk since the Berkshire Weekend Walkers was formed, was led by Christine. Although we'd had a lot of rain over Christmas, it was dry and sunny, although it wasn't very dry underfoot! The unusually warm weather we've had this autumn and winter meant that there were some daffodils flowering by the roadside, in December! 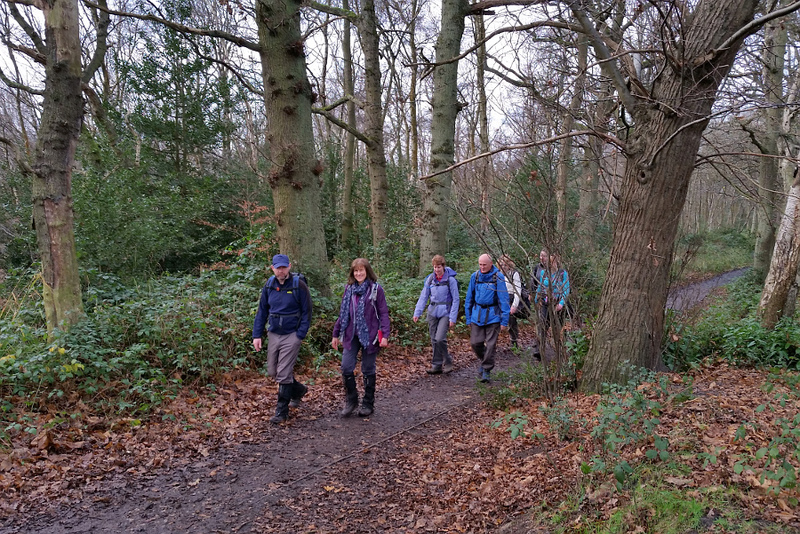 After a bit of chat about what sort of Christmases we'd all had, we started the walk by heading east through Blackmoor Wood, then briefly joining the Chiltern Way on its way to Ibstone Common. Ascending from Lower Vicar's Farm to Upper Vicar's Farm. We turned northward before reaching Ibstone and made our way through fields and woodland to Lower Vicar's Farm. From there we turned westward and headed uphill, past Upper Vicar's Farm before stopping for lunch at some picnic tables overlooking Aston Rowant nature reserve. 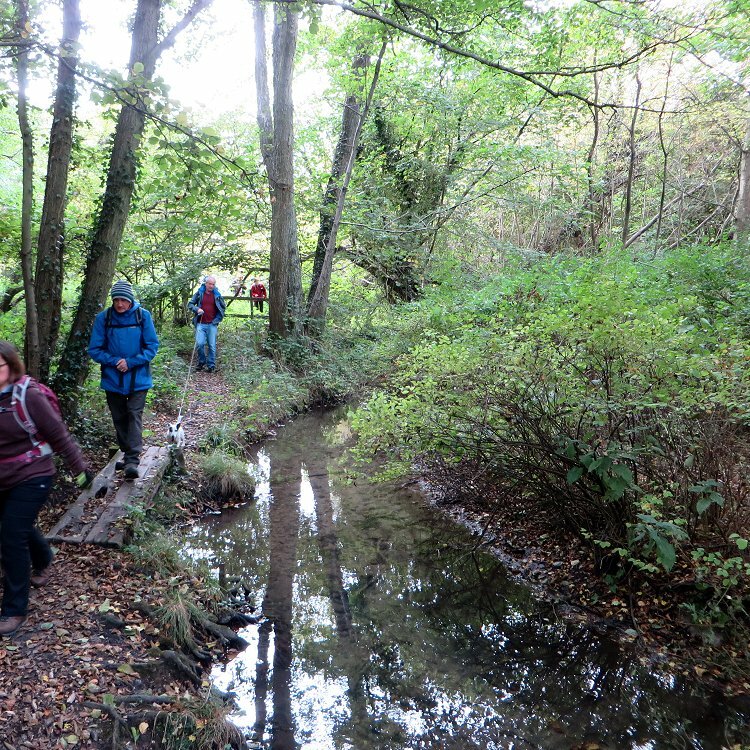 After lunch we crossed the nature reserve and picked up the Ridgeway at a point where it is also known as the Swan's Way. We followed this south-west until it crossed the Oxfordshire Way, which we joined heading south-east, back to Christmas Common village. Some of us stopped for a drink at the village pub, which was incredibly busy, before heading back to the car park. See our route on Bing Maps.